Let’s kick off the journey to Ghana! A west African country bounded on the north by Burkina Faso, Togo on the east, Ivory Coast on the west and to the Atlantic Ocean on the south. Once a British colony, the Republic of Ghana became the first country to win independence from a colonial rule in the Sub-Saharan Africa. With a population reaching 28 million of inhabitants, Ghana is part of African’s great success stories. HOW CAN AFRICA HR SOLUTIONS HELP MY BUSINESS IN GHANA? Africa HR Solutions Ltd has become a major player in the African market regarding employment, payroll and compliance. Due to the convergences which are occurring in the industry, Africa HR Solutions Ltd considers this sector as a main priority. We have entities in each African country and wholly owned subsidiaries, joint ventures and strong relationships with several In-country partners. No matter how many employees you have, Africa HR Solutions Ltd simplifies the human resources, payroll, and administration processes. Starting from Integrated payroll and benefits to administrative support, we take charge of your human resources requirements. The HR environment within businesses is constantly evolving. Every day growing and everyday becoming much more employee-friendly, Africa HR Solutions Ltd provides each employee with access to an online service portal accessible through mobile phone technology and at any time of the day. No matter what your needs are, we provide employers and employees the access they need and when they need it. Total compensation is important. 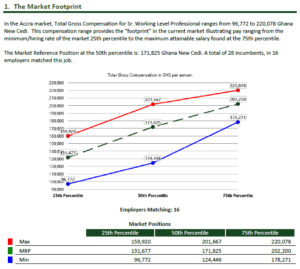 Base salary accounts for about 85% of total compensation in Ghana. The rest consists of fixed cash allowances, short-term incentives and in-kind benefits. To ensure you are competitive, be sure to look at your total compensation versus market data. Over 20% of employers surveyed in Ghana reported some sort of food and beverages, recreation activities and subsidized loans. Loans typically provide modest amounts for cars, housing or personal reasons, with various limitations on amount, duration and interest rate. Private medical insurance was reported by 80% of employers. Of those, 89% covered employees and immediate family members. Employers must offer competitive total remuneration packages to attract, retain and motivate staff. The only way to ensure your package is competitive is to rely on market data provided by reliable suppliers. Birches Group offers HR solutions for developing markets throughout the African continent and globally in a total of 155 countries. The company conducts in-depth compensation and benefits surveys that take the pulse of global labour markets. Surveys are updated three times a year, ensuring results reflect the dynamic pace of market activity in Africa. Birches Group specialists use personal interviews to establish job comparisons, going beyond simple functional and title comparison to include an examination of the structural context. This provides a true assessment of comparability. The Birches Group survey provides in-depth details about base salary, plus all cash payments and benefits in-kind on offer. It is the only survey that provides this level of granularity with regards to total remuneration. Unlike other surveys, Birches Group uses a combination of actual incumbent data together with salary structure data to provide a rich and meaningful way to understand market trends. The combination of structural data and incumbent values is referred to as the “Market Footprint.” Reports can be prepared for any job in any African market. Accra is Ghana’s capital city; the beating heart of this inspiring country. This stirring city will drive visitors and expats to good shopping outlets, beach bars with an excellent Ghanaian nightlife experience. Accra may not have good city sights but the beauty and the diversity which exists will take you back to Ghana’s history. A memorable souvenir for adventurers. English is the official language of Ghana. It is universally used for education and endorsed purposes in addition to nine other native languages. The most extensively spoken local languages are: Ga, Dagomba, Akan and Ewe. Hailed for its economic, political and social stability, the Republic of Ghana is the known as the Golden child of Africa. Ghana has made tremendous progress these years, reducing then poverty. The agricultural sector employs around 41% of the locals, contributing then to a major poverty reduction. The industry is the largest source of employment for Ghanaians and is dominated by sharecropper farmers producing food and cash crops. Ghana represents the 92nd largest export economy in the world and the 122nd most complex economy according to the Economic Complexity Index.